Welcome to the toxic workplace! You may have already been here before, actually. Maybe you worked for a business you knew was bad out of necessity. You might have taken the job for a paycheck, desperate to find work, only to discover a unpleasant company culture and dysfunctional boss lurking beneath the surface. The inverse could have happened, too. You might have started a rewarding position, only to watch it gradually fizzle over time. Great leadership was phased out, perks and benefits were cut, and the overall atmosphere diminished as talented employees saw the warning signs and exited quickly. A toxic work environment isn’t one where you had a bad day or made a couple of mistakes one time. It’s a place where negativity champions every aspect of the business every day. This kind of atmosphere impacts your own sense of self, causing your health to take a nosedive and making you less productive. Instead of feeling confident and proud of what you have accomplished, you’re wracked with fear and worry that everything you do is wrong. You want to speak up and initiate change, but are too afraid of the consequences. 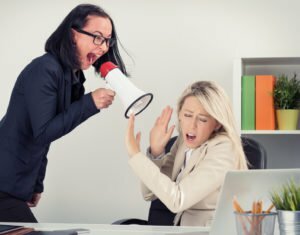 What can you, a lowly employee, do when confronted with the reality of spending your days in a toxic workplace? Before you dive into taking action, you must first recognize and understand what makes the company toxic—and not having your favorite snacks stocked in the break room doesn’t count. You may have spotted common red flags at the beginning, or found out about them later. Higher up individuals routinely go on power trips with employees they perceive to be beneath them. They’ll never provide constructive feedback, but they give “this is wrong and you are stupid” criticisms. You don’t feel good being there, physically. It’s not uncommon for you and your fellow coworkers to call in sick on a regular basis. You have legitimate complaints, but can’t approach anyone with them. You don’t have anyone you can trust or think anyone will listen. Not even HR seems like they can help out—and that hurts. Despite it all, you still believe in your job and what you do. (If not, you would have been part of the turnover crowd a long time ago.) You want to make changes and believe shifting to a transparent environment can be done. If you want to remedy a toxic situation for the better, here’s what you need to do. The toxicity may not be your boss or any one person within the company. There could be a variety of factors that have had a domino effect over the years aiding to the poor work environment. It’s time for you to do a little research and find out what went wrong. Try to connect with former employees who worked for the company years ago—you can find them on LinkedIn. Ask them how they remember the business. Let them share with you what the company did right and try to uncover a common thread to the slippery slope downward. You can keep all of this information confidential, of course, but you want it on your side. The more you know what led to the creation of the toxic workplace, the easier it will be for you to find a way to end its reign. Don’t waste your time on idle gossip. Be the employee who brings positivity to conversations and turns around catty chatter for constructive collaboration. Discuss with coworkers projects you would like to get off the ground running and see who wants to join you. Encourage everyone to contribute ideas and applaud their brainstorming efforts. Work hard, map out a strategy, then take your plan to the boss along with your coworkers. Share what you’ve been doing and how this particular initiative can provide a return on investment for the business. You can’t change anything if you stay quiet or refuse to speak up and break the mold. Being the example ultimately means being brave enough to leave fear at the door. Your behavior will speak volumes about the type of leadership capabilities you possess and the kind of trust and faith your teammates have in you. There is a phrase “Kill them with kindness” that is often used in situations like this. The gist is that no matter how many people are mean to you, you should not acknowledge their behavior and you should always be kind. This tends to throw individuals for a loop. After all, they’re expecting you to sink to their level. However, there’s something about this phrase that feels forced to me. It’s almost as though you’re only focusing on being extra kind the to people who have wronged you specifically. Why not treat everyone with a mutual amount of kindness and respect? Be kind to everyone you work with, no matter which department they may be in. Act as their cheerleader. Applaud their hard work and motivate the team to keep on doing great things!